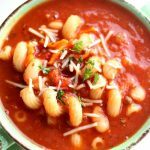 Instant Pot Pasta e Fagioli Soup–your favorite soup from Olive Garden made quickly at home in your pressure cooker. White and red beans, ground beef, tomatoes and pasta in a savory broth. 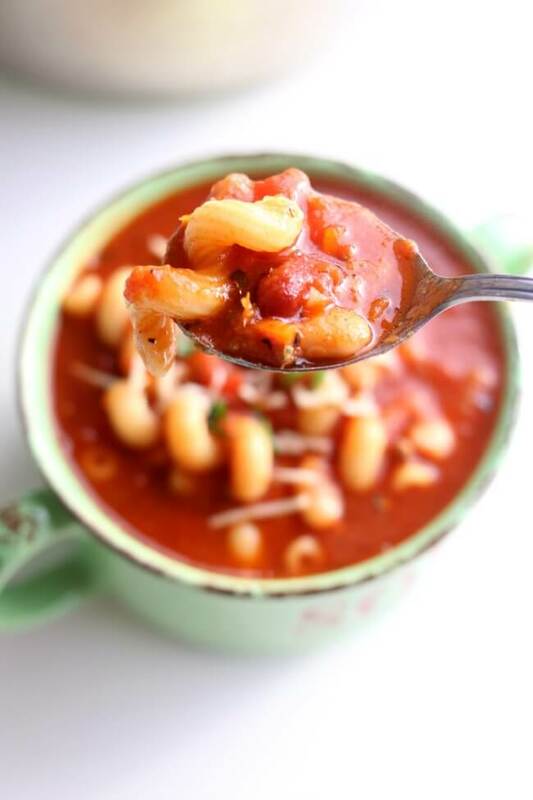 For years my slow cooker version of pasta e fagioli soup has been super popular. 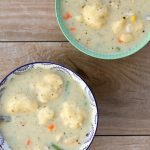 I love to make this soup when I’m feeding a huge crowd because it makes a lot! Last night I made it for our neighborhood Halloween block party and it was eaten up in no time. I love making breadsticks or homemade rolls to serve with this soup. And maybe even a simple salad with the Olive Garden salad dressing to make the experience complete. 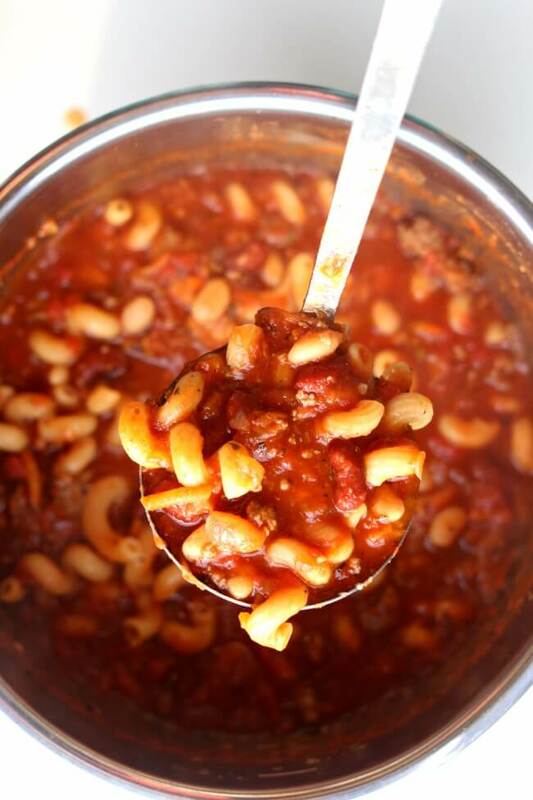 The Pasta–Usually I make Instant Pot Pasta e Fagioli Soup with ditalini pasta. When I went to the store yesterday I couldn’t find any so I substituted with cellentani pasta. Either will work. In fact you can use plain old elbow macaroni noodles and that will work awesome too. The other thing you need to know about the pasta is that is soaks up a lot of liquid. The longer it sits the less it is like a soup and the more it is like a goulash. So this is what I propose…if you’re making it for a crowd to eat the very same night then cook the pasta in the soup. Easy peasy. If you’re making a batch of soup and having the leftovers all week then boil the pasta on the stove separately. 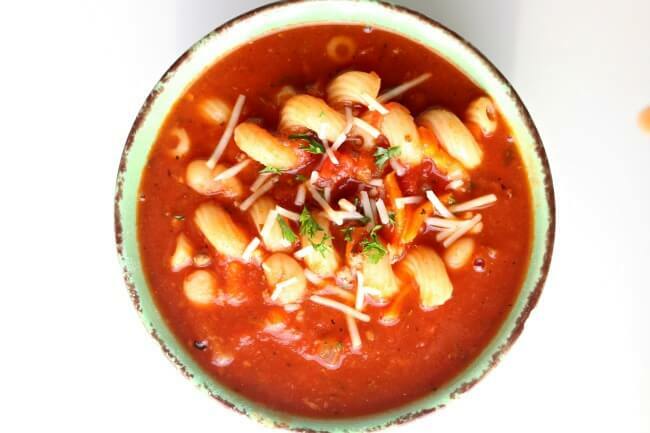 Ladle a bowl of soup into a bowl and add the desired amount of pasta into your bowl. Keep the pasta and soup in different containers in your fridge and whenever you want soup add the cooked pasta right before eating. 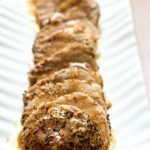 Can I halve the recipe?–yes. It’s kind of a pain in the booty to only use half a can of beans though. So what I would suggest is leaving out the Great Northern beans and just using one can of kidney beans. Also the crushed tomatoes I buy come in a large 28 oz can but I’m positive I’ve seen a 14 oz can before at the grocery store. Everything else is really easy to cut in half. Instant Pot Italian Tortellini Soup–a favorite from childhood, everyone loves this soup! 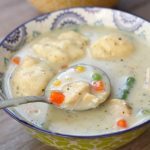 Instant Pot Chicken Gnocchi Soup–another Olive Garden copycat soup! Instant Pot Creamy Tortellini, Spinach and Chicken Soup–one of the most popular recipes on my website! Instant Pot Lasagna Soup–serve with a dollop of ricotta on top! To make Instant Pot Pasta e Fagioli Soup I used my 6 quart Instant Pot Duo 60 7 in 1. I also own the 6 quart Instant Pot IP-LUX60 V3 Programmable Electric Pressure Cooker. They are both great pressure cookers! The first one I mentioned has a yogurt making function but other than that they are fairly similar. The price difference between the two is about $20. What is your favorite pressure cooker and why? I’d love to know! 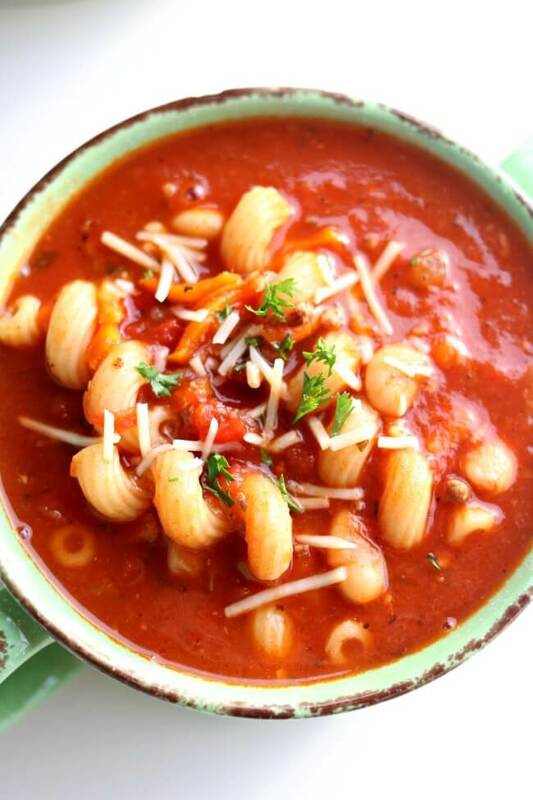 Your favorite soup from Olive Garden made quickly at home in your pressure cooker. 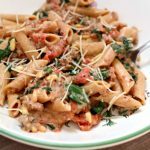 White and red beans, ground beef, tomatoes and pasta in a savory broth. 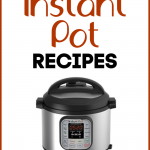 Turn your Instant Pot onto the “saute” function to the highest setting. When the pot is hot, add in the ground beef and brown. Break the beef up with a wooden spoon and let it brown. Lightly salt and pepper the meat. Add in the onion and garlic. Stir until the onion is translucent. Drain off excess grease. (I used 85% lean ground beef so there was a bit of grease, if you use leaner there will be less grease). Add in the carrots, celery, crushed tomatoes, tomato sauce, better than bouillon, water, kidney beans, great northern beans, salt, pepper, oregano, basil, thyme and apple juice. Add in the uncooked pasta* (see my note below). Stir. Open the lid and stir the soup. Ladle into bowls and top with Parmesan cheese and a bit of parsley. Usually I make Instant Pot Pasta e Fagioli Soup with ditalini pasta. When I went to the store yesterday I couldn’t find any so I substituted with cellentani pasta. Either will work. In fact you can use plain old elbow macaroni noodles and that will work awesome too. Get all my new recipes delivered to your email inbox. Which recipes do you want? I also have the same Instant Pot as Lee, and I didn’t have the problem encountered. I had everything mixed up in the preparation. It’s true that it’s a little thick, maybe we should adjust the water. I made this soup yesterday for dinner… a pure delight! We really liked this soup. My husband kept saying how good she was! I cooked my gluten-free pasta on the stovetop. The celery and carrots were a little crunchy, next time I’ll grate the carrots and cut the celery even smaller! Since I didn’t have any ground beef, I had lean ground pork. Thank you Karen for all your great recipes! Tried in a Instant Pot Ultra 80. Followed all of the instructions. Had a problem with a burn indication showing on the screen before the IP reached pressure. Ended up using the slow cook feature for 30 minutes with a temperature setting of 175 Deg. F. Flavor was good but probably not as good as if I was able to use the pressure method. Any ideas on how to avoid the burn indication. Suggestions would be greatly appreciated. Thank you. Perhaps try “layering the ingredients” instead of stirring them in. So start with the beef as written and then add the water. Then layer the rest of the ingredients on top of the water. Thanks for the response. Seems like I’m the only one who had the problem. Will follow your advice for the next time. There definitely will be a next time very soon. The flavor is amazing. No need to go to the OG restaurant. HI! If you cook pasta separately, there are no adjustments to liquid amounts in IP? I am gluten free right now. Have found GF macaroni that cooks okay in the IP, but cooks for 4 minutes. I don’t see a problem for any of the other ingredients, do you? I bet that would work The other ingredients seem okay to me. I am not a GF expert though! I’m sure you could leave out the meat all together. Maybe add in some mushrooms??? Yes, you can make this vegetarian with substituting any type of ground crumbles (Boca, Morning Star, Gardein). Sometimes I skip sautéing the crumbles and just put them in the cooker after everything else is sautéed. I do break up the crumbles in a separate bowl before adding. Mushrooms would be great in this recipe too. I add mushrooms to a lot of recipes. They are packed with vitamins! Another winner! So glad I stumbled across your site. Looking forward to eating this for lunch all week. This recipe is the first thing I’ve made in my IP and it was absolutely delicious! I made it as printed except I used diced tomatoes as I thought I had crushed but did not. My father-in-law loved it as well. Now just waiting for hubby to get home from work so he can try it. I’m sure he will love it too. Thanks for such a great recipe!! I made this for dinner tonight. It was delicious. I doubled the pasta so I had to add just a little water to the serving dishes to make it more “soupy”. I also added 1 tbsp of sour cream to the serving bowl and mixed it in. I also didn’t have apple juice so I added a qtr cup more water and 2 tbsp of my homemade apple butter just to get the little bit of apple flavor in there. Soooo Good. Thanks for the recipe it will be used often. Excellent recipe. Tastes just like Olive Garden’s. Didn’t have any fancy pasta so I used macaroni. Worked great. Also didn’t have any apple juice so I just skipped it. Used 3 cups of beef stock instead of better than bouillon. Obviously this is a very forgiving recipe. 😀 Since I made this for just my husband and myself, I made the full recipe but froze half of it without the pasta. I then used 4 oz of pasta in the soup that I made tonight. When I cook the frozen batch, I will add another 4 oz of pasta. Thanks for a great recipe. Is there anything you can use in place of the Apple juice? I have all the ingredients to make this except for that. Maybe just more broth? I’m sure that will be fine. If I cut the recipe in half, do I also have to make an adjustment as to how long to cook the soup in the instant pot? 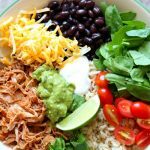 I made this last night – delicious and easy! Thank you for the recipe! So instead of 1T. of Better Than Bouillon, you use 3 C. of beef broth? Or does this also take the place of the water? Thanks.